Following up on Summer Car Crashes 2008 (Fabiolus, Pure Luck and Quality), Food GPS has news that Thai Town-adj Spicy BBQsuffered the same fate last week: "Luckily the Northern Thai restaurant was long closed and nobody was inside. 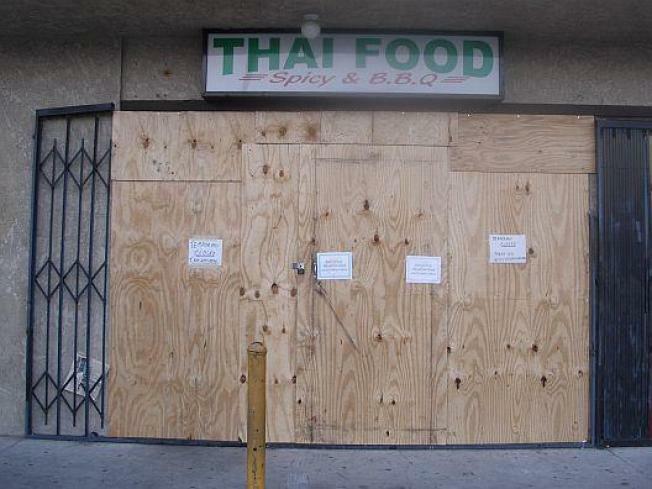 Unfortunately, Spicy BBQ (recently featured in Gourmet) was boarded up when I showed up for a late lunch. Kanlaya 'Nong' Sriyana and niece Kay were out front with an assessor. They were clearly heartbroken. It’s unclear whether or not Nong will be able to rebound. For now, a sign says that they’re 'remodeling' and 'closed until further notice.'" Does this make anyone else rethink sitting on sidewalk patios here in LA?